According to the National Flood Insurance Program, everyone lives in a flood zone: anywhere it can rain, it can flood. Flooding can be caused by heavy rains, melting snow, inadequate stormwater drainage systems, ice jams, other factors, or any combination of the above. In the early morning hours of June 27, 1998, Waitsfield and nearby towns were struck by a flash flood that swept homes away, destroyed property, and inundated Waitsfield Village. Though no injuries or lives lost were reported, there was extensive damage to property and personal losses of other sorts. No one saw it coming. And no one saw it coming on May 20, 2011 when a microburst storm over the Northfield Ridge dumped more the four inches of water in less than 45 minutes, washing out roads, driveways, culverts, and more. On August 28, 2011, Tropical Storm Irene dumped [?] 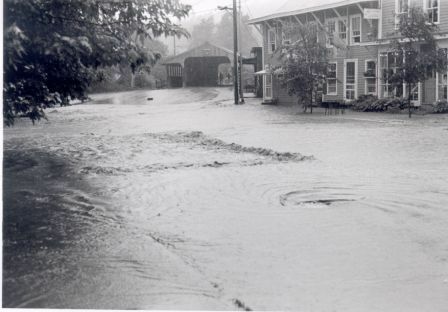 inches throughout Vermont that broke 1927 historic levels and caused extensive damage to roads, bridges, and property throughout Vermont. Are we prepared if it happens again? The goal of these pages are to help inform citizens and local officials of the information available about the many things we can--and should--do to prevent future damages due to flooding.